My name is Kate Nolan and I am a Trek Women’s Advocate and co-founder of DNK Presents, an outdoor adventure company. I am a Professional Mountain Bike Instructors Association Level 1 Coach, Backpack guide, Leave No Trace Trainer, climbing guide and member of the American Mountain Guide Association and certified in Wilderness First Aid and CPR. I love to mountain bike, I am a crosscountry, 24hour, 12 hour and adventure racer. DNK Presents leads empowering adventure retreats. 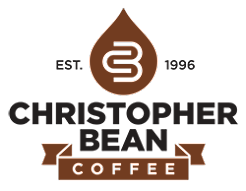 My wife, Danielle and I started the company in June of 2014 because of our love of the nature and adventure. We truly live our lives adventurously and we credit our personal and professional success to the challenges we’ve faced in the outdoors. 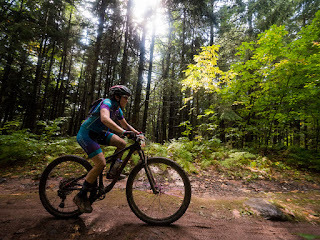 We quickly discovered women were having breakthrough moments while we were coaching women’s mountain bike clinics, leading backpacking trips and in our climbing programs. They were going on to compete in their first mountain bike race or adventure race, to take their families out biking and backpacking, some even went on to summit mountains in Colorado and Oregon. The stories kept coming and we began hearing about career changes, business startups and seeing the beautiful growth in all these amazing women. 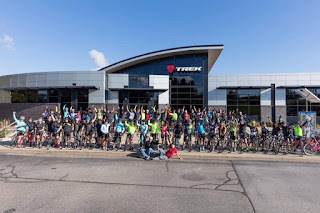 When I was nominated by Charlie Revard of The Bike Line Indianapolis and Colin Kuchy of Trek Bicycles to be a Trek Women’s Advocate, I cried. Biking has been such a huge part of my life, I raced BMX as a child and started mountain biking in the early 90’s. My first mountain bike was a purple Trek 920 and it helped me discover a new sense of freedom and self. It came at a time while I was dealing with the loss of my mom to cancer. It really brought me out of a dark place and helped me find strength and community. Then, I discovered I had to complete an application and I got nervous. After all, they selected only 54 women out of over 250 candidates. 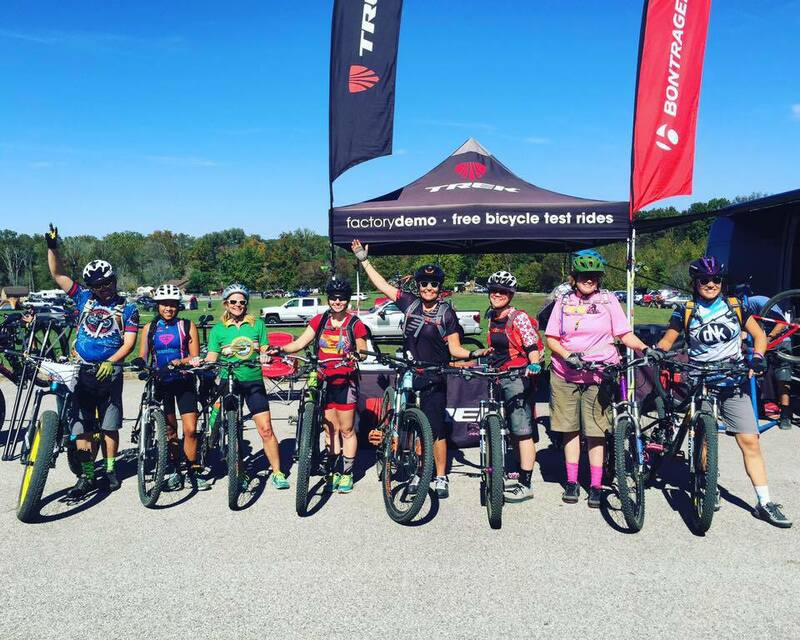 It such an honor to lead community rides, host clinics and events as a Trek Women’s Advocate. 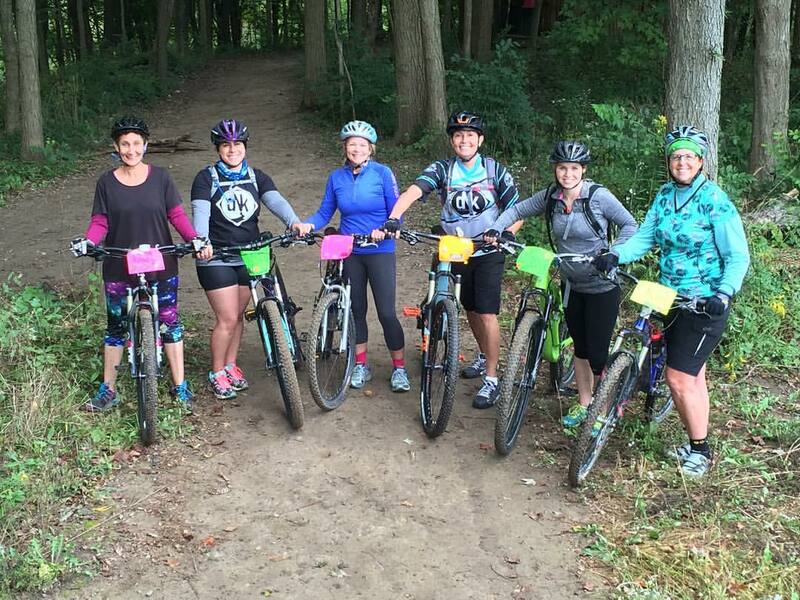 We’re giving women a safe place to try something new, learn to mountain bike or improve on their riding skills and did I mention an opportunity to meet other badass women. 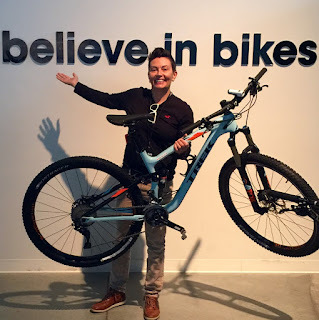 Trek has really created something special and I am so excited to be a part of it and to get more women on bikes and empowered through cycling. My company, DNK Presents has committed to doing a Women’s Adventure Contest each year and giving away a trip to 4 women based on nominations. Our first contest was this year and took over a year to plan it. 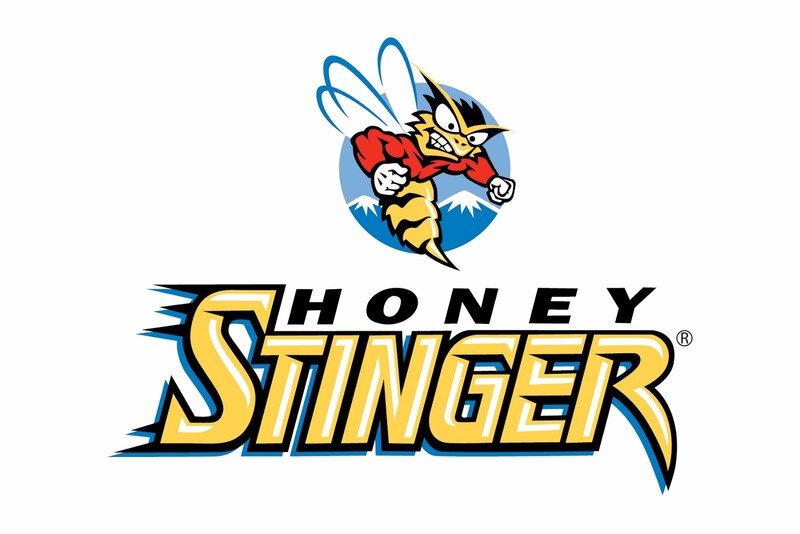 We began accepting nominations in January and February and received over 60. We had over 20 corporate sponsors jump on board, including Trek and Athleta. Our local bike shop, The Bike Line donated mountain bike kits and helmets to the winners and our local outfitter, Rusted Moon donated hiking boots. We shared their stories and journeys through a documentary, Live Adventurously. My brother, Joe and his friends had a built a ramp at the bottom of hill on old farm that bordered our neighborhood. I would sneak off with my friends, Billy Lockwood and Jimmy Elsworth and we'd take off down the hill on our kiddy bikes with banana seats and take flight. We had so much fun and felt so free! You started with racing BMX and eventually transitioned to mountain biking- what was your inspiration for mountain biking? My friends Eddy Drotar and Richie Crane introduced me to BMX racing when I was in the 4th grade. It took me a few races to bring home a ribbon or a plaque but I was hooked. Barry Mayo had an indoor track on Michigan Avenue. He converted an old furniture store into a great big playground with pumps, berms, a wicked hill start and arcade. Once I got to college, some friends took me riding on the trails in Pinckney, MI and along the river in Ann Arbor. After my first trail ride, I became the proud new owner of a Trek 920 mountain bike with front suspension painted in one of the most beautiful shades of purple I had ever seen. When I was on the bike, I felt strong, free and found amazing community of friends. Mountain biking helped me overcome the loss of my mother with her battle to cancer. What has been your favorite competitive event (or events)? Indiana is my home and I absolutely love the, Do Indiana Off Road Series races (DINO Series) , DINO Enduro Series and 24 hours of DINO are some of my favorites. DINO also hosts the Death March which is crazy scavenger hunt through Hoosier National Forest on trails and gravel roads. You race in teams of two and seek out cemeteries. This Death March is approximately 60-80 miles depending which checkpoints are drawn at the start line and the weather can go a variety of different ways since it’s Indiana in March. The XTERRA Southern Indiana was a great race for me. Two years ago, I qualified for the XTERRA National Championships. What was the point where you felt that you were ready to participate in events and what inspired you to take on the events you have? Getting out and meeting like minded individuals, pushing yourself, having fun and improving are what motivates me the most. Why do you feel women participating in events is a positive thing? Ladies, we are tough and the events and the community that come along with the races are amazing. We don’t always give ourselves enough credit. Even in our professional careers, we want to be 100% qualified for a position when men only need to be 60% qualified to apply. Just give it your all, best case you podium, worse case you meet some awesome new friends. Do you have suggestions for those on the fence about participating? Especially when they may not podium? I say go for it! Sign up for an event, get to know others in the biking community, pick an event at your favorite local trail and go for it. 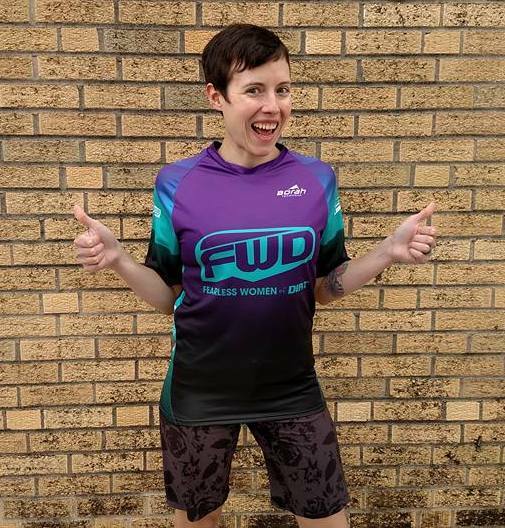 You’ll make lots of great friends, become part of an awesome community and build confidence and improve your skills while having a great time. My first mountain bike ride was pure bliss. I was on an old borrowed Gary Fisher. It was great to step away from the stresses at home, the stresses at school and feel that freedom I discovered as a kid. I had an awesome mentor, sponsored triathlete, runner and yoga instructor, Robbin Schneider who helped me overcome the anxiety. She taught me to roll back my shoulders, open my heart to the sky and breath. I still hear her voice in my head when I get stressed. Clips or flats- what do you love and why? I go back and forth between the two. Racing generally clips. When I am out riding with friends, traveling or coaching mountain bike clinics, I go with flats. Plus, it takes me back to my BMX days. Getting out and riding your bike, training, always keeping a positive attitude and expect the best results. It’s easy to think I am not fast enough, not good enough, so stop apologizing and give it your best. You’ll be impressed with the outcome. I love to sing while pushing myself, it keeps me smiling and going and makes everyone else around me smile too. When I started I learned from fellow riders, friends and competitors. My suggestion is to take a clinic if you can. You will learn so much and be able to take those skills with you and practice and build on them. I’m fortunate enough to be a Professional Mountain Bike Instructor Association (PMBIA) Instructor and have the rewarding job of teaching people to ride more efficiently, learn the skills, build on them in a safe environment and have an awesome time doing it. I believe if you’re not smiling while mountain biking, you are doing it wrong. We are all trying to learn and build on our skills. I have really been working on the manual and being able to hold it. My approach is to set aside some time to practice, take a clinic, watch videos and before you get frustrated take a break and come back to it. Eventually, it will make sense to you and you’ll get it. What do you love most about having a wife and partner who enjoys the same things you do? It is so awesome to share the same passions, to experience the same adventures together, it really brings you closer and strengthens your relationship. I knew after completing our first Death March Adventure Race, we knew we could do anything together. DNK Presents has been a huge part of your life- what do you love most about owning your own business? It so great to get out and share your passion for the outdoors and adventure with others. There’s nothing more rewarding than helping people find themselves, achieve new goals, improve their riding, get out and complete their first race, summit their first mountain and hear their stories. What has been the biggest challenge with owning your own business? What has been your greatest success? The biggest challenge was starting an adventure company in Indiana. We’re not necessarily known for our mountains, races, rock climbing or hiking. 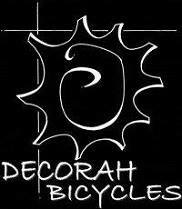 We have awesome mountain biking in Brown County State Park, a 28 miles IMBA Epic trail system, the Hoosier Mountain Bike Association is adding a flow trail in 2017, you can thru-hike the 42 mile Tecumseh Trail and the rugged 58 mile Knobstone Trail as well as rappel 100’ at Hemlock Cliffs. Most people don’t even realize what all we have right here in the state. Our biggest success has been the DNK Presents Women’s Adventure Contest and documentary film, “Live Adventurously”. Danielle and I are committed to do the contest each year. Our documentary short of the 2016 contest recently played in Banff, Canada, and is premiering on April 14th at the Indianapolis Museum of Arts outdoor amphitheater. Why do you feel it's vital for women to be involved with the outdoors, be it biking or other types of outdoor adventures? It’s empowering in their personal lives and professional careers. When we are kids, we play side by side with boys, right? Then,we get to around age 13 or so and stop. We start doing what’s society shows us is appropriate for girls. I compare it to a baby elephant, the trainer ties the baby to rope and drives a wooden peg in the ground, as the elephant grows bigger and stronger it could easily pull the peg from the ground but it remains there because it doesn’t believe it can pull it out. We need to pull the peg out of the ground ladies! We can do it and it’s awesome. Challenge yourself, learn, grow, lift each other up and have a damn good time doing it. I have a Trek Fuel EX 9.8 that is my favorite bike. It fun to ride, the travel on the suspension can handle drops in the mountains and on the downhill trails, it’s capable of 29” or 27.5”+ wheels, it’s super light and fast. She’s basically fierce and flawless and she’s in racing blue and orange. My other ride is a Knolly Endorphin, I won this bike at the Sedona Mountain Bike festival. It’s also fun, lots of travel, it’s stretched out to handle Whistler terrain, it’s homeland. I have a Trek Madone 5.4 that I use for country roads and work. She’s also blue, fast and rigid. Giant Anthem X 29 is my winter bike currently, she was once my go to Crosscountry racing bike with less travel, lightweight and fitted for speed. You are one of 54 Trek Women Advocates- what are your hopes and goals for the upcoming year as an Advocate? What an honor this is and I plan to get more women on bikes. 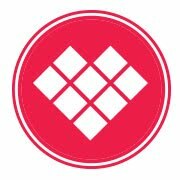 I want to build an awesome biking community in Indy for women. I have put together a calendar of rides, clinics and events to give women a platform to learn together in a fun safe environment. I have a Trek Women’s Clinic on April 30th, some mini clinics on mountain biking, maintenance, safety and clothing. My hope is to get more women out there getting more comfortable, learning new skills, challenging themselves in a fun safe environment and building on those skills. Trek Women Rule! 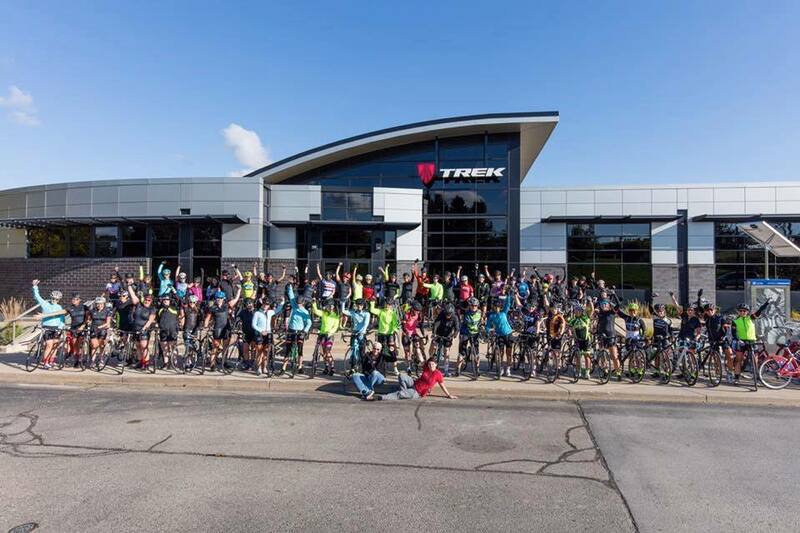 The Trek Women's Advocate program is just getting started- why are you stoked to be part of the program? My first bike was a Trek, it helped me get through the loss of my mother at age 19. Trek has always been a leader in racing. Look at their current women athletes, Rachel Atherton - downhill (Perfect Season 2016), Emily Batty - xc mountain biking, Bronze Medalist in the 2016 Olympics, Katie Compton - cyclocross. John Burke is committed to women and making this program a success. He believes if a woman is on a bike then it’s a women’s bike. I am so honored and grateful to be representing Trek and working with so many inspiring women like Candace Shadley of Trek Dirt Series, Sally Marchand Collins of Sundance Mountain Bike Skills Clinic and Erin Blackiston Wells of Muddy Pedals and so many others! What does it mean to you to be a Trek Women's Advocate? This is a truly a dream come true. This falls into place with everything we’re doing with DNK Presents and women’s empowerment. Biking has played such a huge role in my life and who I am. There’s nothing quite like the feeling of getting out on a bike and exploring. You see things in a new perspective and experience such joy and freedom. I can’t stop smiling! Most women are introduced to it by a spouse, boyfriend or brother and it can be intimidating. It such an awesome experience to get out there alongside other women and to experience that sense of community and work together as a team. Coaching women’s clinics are my absolute favorite. To see it come together and click and the joy and confidence it brings. Something changes when you’re out there with other women discussing and committing to your line choice through a rock garden, riding that first skinny or going over a teeter or log. It’s amazing and life changing! Programs like this, encouraging women to work together, to learn together to create that sense of community. To make mountain biking more approachable, to enjoy free group rides led by professional mountain bike instructors and also introducing the next generation to mountain biking and biking in general. We’re so much stronger together and as women, I believe we sometimes lack balance. We maintain traditional household roles, have professional careers and sometimes don’t take time for ourselves. It’s so important to step back and have some good healthy fun alongside our peers. It’s been so rewarding for me personally. It’s freedom, fun, therapy on two wheels and there’s nothing better than sharing that joy with others. Seeing the smiles on the faces of others makes my soul happy. My dad told me growing up to never let anyone tell me that I couldn’t do something because I was a girl. He also told me to always give 100% because everyone would be watching me. At age 12, I received my black belt in Tae Kwon Do Ji Do Kwan.